Posted on August 4, 2014 March 4, 2015 by Sarah R.
In that letter, I linked directly to several passages of important documents and guidelines governing our profession, including passages from the American Library Association Bill of Rights, as well as from ALA documents discussing its stance on intellectual freedom, a set of principles that any librarian or information professional will tell you are held sacred by those in the field. Why these principles apply to all information practitioners and institutions, they resonate especially strongly in the context of public libraries, one of the few identifiable sites in many communities open to all members of the community and engaged in the practice of providing access to information of all kinds – even (especially?) material to which some people may object. “Intellectual freedom is the basis for our democratic system. We expect our people to be self-governors. But to do so responsibly, our citizenry must be well-informed. Libraries provide the ideas and information, in a variety of formats, to allow people to inform themselves. After watching the situation unfold on Twitter, I wrote my aforementioned letter to Ms. Lyons. I was particularly concerned by what the email to Abunimah described as the nature of the internal dialogue taking place at the EPL regarding his talk, for two reasons. As many people familiar with debates and attempts to get issues related to Palestine discussed in public fora within the United States, the concept of “balance” is frequently used as a mechanism to forestall such discussions. It is a tactic used to derail, to suggest that the topic of Palestine, the situation of Palestinian people, or anything remotely related is so exceptional in some way that it cannot ever be presented to stand on its own without immediate and urgent rebuttal or challenge from someone arguing what is presumably from the so-called other side, a pro-Israeli perspective. Indeed, as reported by the Adult Services staff member – who, it bears mentioning, certainly found herself in a terrible position last Friday – this “notion of balance” was exactly the reason to which Ms. Lyons appealed as reason for cancellation of the Abuminah book talk. It is unclear exactly what she had in mind. Would another journalist, public intellectual and author touring with a recent, newsworthy book, but one written from a Zionist perspective, be the ticket? Those were Abunimah’s credentials, after all. Yet, according to the email, the library was looking for any “pro Israel speaker” (later described as [sic] “an Israeli speaker”) at all. Interestingly, they were unable to find someone to foot the bill. It was at this point that Ms. Lyons insisted that the event be cancelled. For people who are interested information dissemination regarding Palestine, the issue of “balance” served up as an excuse to cancel an event – or to not hold it in the first place – is all too familiar. This brings me to my second major concern with this cancellation: the notion of “balance” in the context of intellectual freedom as practiced in libraries. In my letter to Ms. Lyons, as well as in this post, I have cited several passages from the ALA’s positions and guidelines on intellectual freedom. The ALA, unlike, say, the American Medical Association, does not license librarians or other information workers (although it does accredit academic institutions offering degrees in LIS). It is a professional organization in which membership, for individuals and institutions, is completely voluntary. And yet its policies, guidelines and statements carry extremely heavy weight in the LIS community, particularly where issues such as intellectual freedom are concerned. Those of you reading who come from outside the LIS community may be surprised to learn that libraries – public libraries, in particular – are not quiet unassuming apolitical sites. In fact, libraries are constantly finding themselves at the center of all sorts of controversies. Often, these come in the guise of so-called “book challenges” – community members (or sometimes library boards) expressing a desire to remove materials from a collection or from circulation based on perceived offensiveness of its content. But other aspects of public libraries’ services can also court controversy. These can include practices and policies pertaining to public meeting room use, for example. Issues can also arise with regard to the loaning of materials to those under 18, or how patrons who are housing-insecure or dealing with mental health issues are treated. Often such situations are triggered by complaints by other patrons. In all of the kinds of cases I describe, the ALA offers extensive guidance and resources for how librarians and staff might respond to the situation. So while ALA is not able to enforce any policies, per se, in a way that the AMA might (there’s no censuring of a librarian, for example), its guidance matters greatly. For this reason, appealing to the need for “balance” in the case of Mr. Abunimah is problematic again. ALA’s intellectual freedom is clear; it calls for the “…right of every individual to both seek and receive information from all points of view without restriction.” In the case of the EPL, the call for “balance” was not, in fact, serving as a mechanism to allow for more points of view but was, contrary to ALA intellectual freedom guidelines, acting as a barrier to information. It was a restriction on that informational flow. The passage goes on to state that the tent of intellectual freedom is designed to allow for the “…free access to all expressions of ideas through which any and all sides of a question, cause or movement may be explored.” This, too, is a critically important passage. Notice what word does not appear in it? That’s because the intellectual freedom tenets are designed to allow for the free flow – dissemination, consumption, debate of – all kinds of information. It does not set up a false dichotomy of presuming two equal and knowable “sides” to each topic or conflict, which is what it appeared was being called for in order for the Abunimah talk to take place. Instead, under the best circumstances, it upholds space for a panoply of ideas and a wealth of perspectives to spring forth and take hold within the library or within the context of it. As I discussed yesterday’s events with a number of LIS practitioners yesterday, another public library director located in the Midwest suggested to me that I was missing the point, that Ms. Lyons and others like her are engaged in a complex balancing act of their own of appeasing their board, their “Friends” (or donors), their patrons and their wider community, as well as being responsible to their peers and to their profession. As such, he suggested that she was obviously dealing with a situation that required her to employ some “realpolitik,” as he put it. It was likely she was being pressured by constituents from at least one of the aforementioned groups, if not more than one, and so she was doing what she thought best in order to skirt controversy and keep calm at her library. Of course, no one involved in this situation, nor those following it, is naive. It is absolutely incontrovertible that the reason behind Ms. Lyon’s singular need for “balance” in this situation was because of a real or perceived fear of controversy, of criticism and of backlash for putting on an event from an outspoken Palestinian-American in the midst of a brutal Israeli military offensive on Gaza supported by American tax dollars and many American people. I have no doubt that that was a daunting reality to face. But it is for just these moments – these teachable moments – that the ALA principles of intellectual freedom, its written guidelines and its volumes devoted to same, exist: to support directors such as Ms. Lyons to take a principled stand on behalf of those patrons – those many patrons – who would like to hear Mr. Abunimah speak, whatever their position is on Israel, Palestine or any other topic. The public library exists as an information commons not just for the easy times, but for the hard times. The intellectual freedom principles matter most not for banal or pedestrian programming that wouldn’t raise an eyebrow, but for the times when it can be used as a backbone to stand firm against opposition or those who would rescind others’ access to information. And it is exactly in those moments in which LIS professionals must take up their duty to their patrons and to their public to not bow to such pressure, realpolitik be damned. As a profession and as institutions, we are only as valuable as our willingness to serve our public. All of our public. And not just when an elusive and confusing “balance” or parity can be struck. The Evanston Public Library welcomes all viewpoints and encourages thoughtful discourse and deep conversations on important and complex issues. We actively promote ongoing conversations by creating thoughtful, multi-part programs and discussions to engage citizens on a regular basis. We uphold the standards of free speech, open access and all of the tenets of the American Library Bill of Rights. 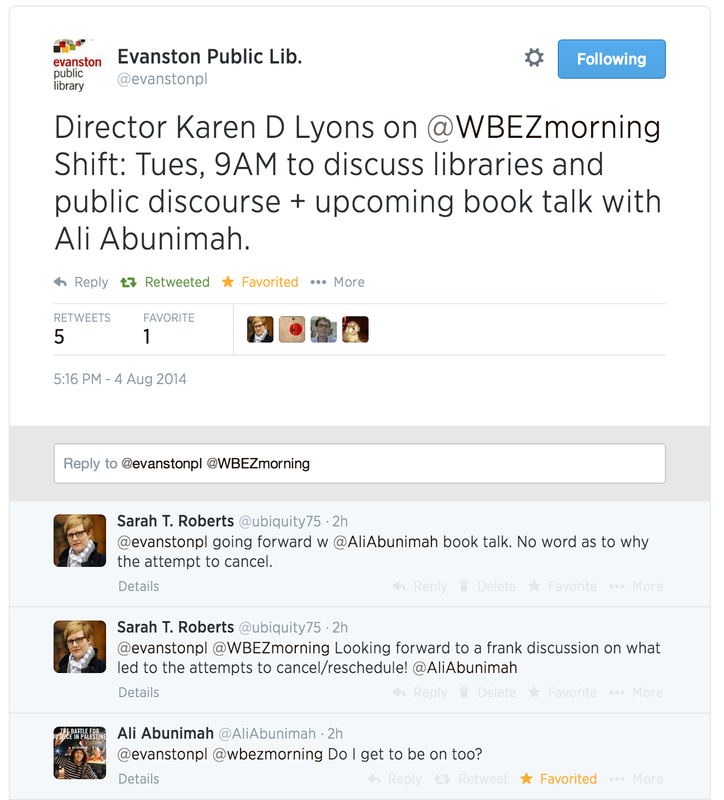 The statement that the Evanston Public Library banned or censored the work of author Ali Abunimah is false. We are co-sponsors of this event and have been promoting this program through flyers, posters, social media and our electronic newsletters. 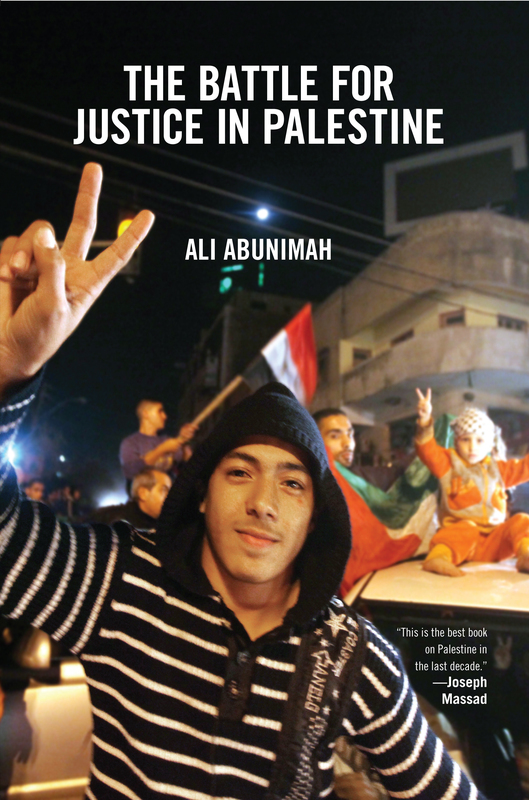 UPDATE: Ali Abunimah’s reading of “The Battle for Justice” in Palestine will occur as planned on Monday, August 11 at 7PM. Seating will be limited to room capacity. From the very first discussion about hosting Ali Abunimah, it was our intention that his talk be part of a deeper and broader conversation. This is an intentional approach that we have taken on a number of other topics, including our recent National Endowment for the Humanities funded “Muslim Journeys” series, our current “11 Months of African American History” programming, our current programs exploring “Youth Violence in Chicago”, this year’s upcoming, year long “Hecho in the USA” programming about the Latino experience in the U.S.A, and our current year-long exploration of World War I in honor of its centenary. The request to reschedule this program was mishandled by the Library. I have contacted the author to discuss with him personally whether he will consider rescheduling this program or is only available on August 11. I await a response from him. Whether this book talk proceeds on August 11th or another date, the Evanston Public Library looks forward to sponsoring this discussion and continuing the conversation beyond one evening. The Evanston Public Library is the perfect place to discuss and illuminate issues that reflect deeply held personal feelings and points of view, along with important issues that reflect world events. So, as of this writing, the show will go on in Evanston – definitely wonderful news! – although “seating will be limited to room capacity.” No word, either, on how the other interesting and varied programming that has gone on at the EPL in the past was “balanced” by other topics or issues. Finally, there is an utter absence of transparency with regard to why this event was cancelled (“mishandled,” as Ms. Lyons aptly describes it in her statement) in the first place. Without some clarity on that issue, the event and those that surround it will move forward with an uncomfortable cloud. Abunimah himself posted his own version of the reinstatement at Electronic Intifada this evening. I suppose my realist (cynic?) colleague might point out that such a reversal could really just be another realpolitik maneuver in disguise, and I suppose that could be right. I think I’ll choose to believe otherwise, for the time being, though. As of yet, there has been no reply. I’m happy to see this further clarification of the ALA standards, particularly as they relate to the issue of balance. Indeed, it is in times like these, for exactly circumstance such as these, that standards regarding intellectual freedom were established. Protection of dissenting voices, opinions, and viewpoints – however unpopular or against the grain they may be – is of vital importance in a society which increasingly acquires its information from within like-minded echo chambers, while simultaneously purporting to value both “fairness” and “balance” (à la “We Report, You Decide”). Unfortunately, it is precisely these very notions of “fairness” and “balance” which create an untenable dualism: if one side or the other is perceived to be off, even by the slightest, the whole equation is thrown out; its calculus deemed unacceptable. This leads to a situation declaring that in order for one unpopular opinion or dissent, one observation of oppression, or one illumination of marginalization to be aired, so too must its polar opposite, with no regard for the broader, all-consuming (dominant) discourse – one which by the very nature of its ubiquity inhabits an “unfair” and “unbalanced” position. This is precisely how ideas such as “reverse racism” and their ilk are propagated. And precisely how the presentation of Ali Abunimah’s dissenting view has come to necessitate the presentation of an opinion under no threat of being “underrepresented” or “unheard”. That this one event, this one voice should be silenced in the name of “balance” is not only farcical, but indeed does a greater disservice to the public it serves. How could any institution, let alone one purporting to preserve, disseminate, and advance knowledge (let alone “understanding”) truly believe the presentation of an opposite voice/opinion (in this case, one that is pro-Israeli and indeed already ubiquitous within the American “marketplace of ideas”) could countervail that of Ali Abunimah? There seem to be three possibilities: (a) the leadership of the EPL grossly misreads the singularity of the debate within the wider cultural and media/information ether; (b) takes its patrons to be wholly incapable of conceptualizing of, or understanding a dissenting voice; or (c) is under an intense amount of political pressure to suppress the dissenting voice. In any case, the EPL has acted not only shamefully but, as Sarah noted, indeed the EPL has acted dangerously. Thanks for your comments, Ryan. It appears that we won’t learn anything more about the real pressures leading to the cancellation, alas. I agree with your analysis, however. As to the WBEZ radio show, I tuned in at 10 and caught the couple minutes with the director. Abunimah was not on the program (so much for “balance?”) and the host mispronounced the name of the website as the Electronic “Infitada.” There is probably an archive online.